Building a better laundry room is a challenge, and the right design can depend upon the space available and your laundry needs. All laundry rooms should accommodate your washer and dryer, but you may also want folding and ironing space, storage and even a pantry in your laundry room. Building in what you need will make for an efficient and pleasant space for this unpleasant chore. Measure the space available for your laundry room renovation. Decide whether you want to simply rearrange and reorganize your space or are looking at a more significant renovation. Sketch out your laundry room design. Decide whether or not you will need professional assistance on your laundry room renovation. If you are not moving your washer and dryer or installing a laundry sink, you may be able to build a laundry room on your own. You can include storage for cleaning supplies, coats or other items. Visit a home improvement center. There are many styles and designs of stock cabinetry and shelving available. Use your measurements and sketches to select appropriate cabinetry. Some home improvement centers can assist you in this process. Installation is typically available for a fee; however, you can mount your own cabinets if you are handy. Empty the space. 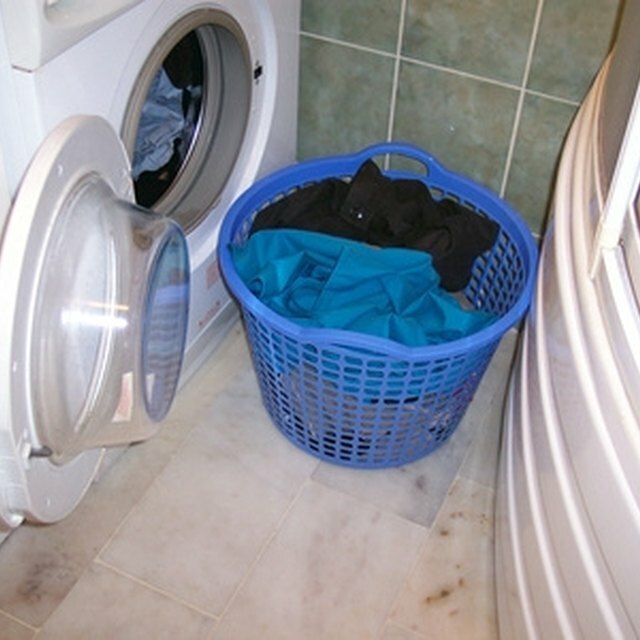 Make sure you have somewhere to store items that will return to the laundry room space. Following manufacturer's instructions, install cabinetry and shelves. Reinstall the washer and dryer or have your new ones delivered. Finish by installing hooks and organizers into your cabinets. Build a laundry room to suit your specific needs and desires. Organize your laundry room. Baskets and bins can help you keep the your new laundry room tidy. Allot space for change and pocket items, detergent, stain treatments and ironing supplies. Consider integrating a pantry or ironing area into your laundry room. Avoid taking on more than you can do yourself, being especially careful of plumbing and wiring issues.